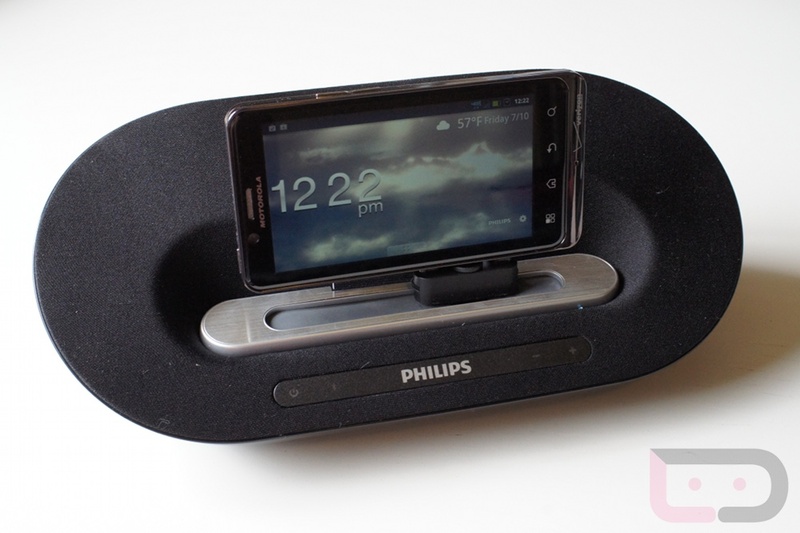 We were very happy to receive one of Philips’ anticipated docking stations for Android in the mail a little while ago and knew that lots of people have been looking for something just like this. Finally, a docking station for our Android devices that has good quality speakers that can rock the house and charge our devices at the same time. A simple device that turned a bit complicated due to software constraints and silly ‘non-existent’ requirements. Let me try to explain. I have needed something like this on my desk for a long time. Something I could just plug my phone into and have some good tunes going in the background. The dock sounds great. Excellent low ends and clear highs. It’s good for any type of music in my opinion, and I usually strive to have a good taste in music. The design itself is great and can fit most Android devices with no issue, so size/device compatibility shouldn’t be an issue if you plan on picking one up. It connects through Bluetooth and AUX but they intend for you to use Bluetooth. You can play music by just having your phone/tablet in range of the device and you only need it connected if you want to charge your phone. This is where I became semi-frustrated with it. 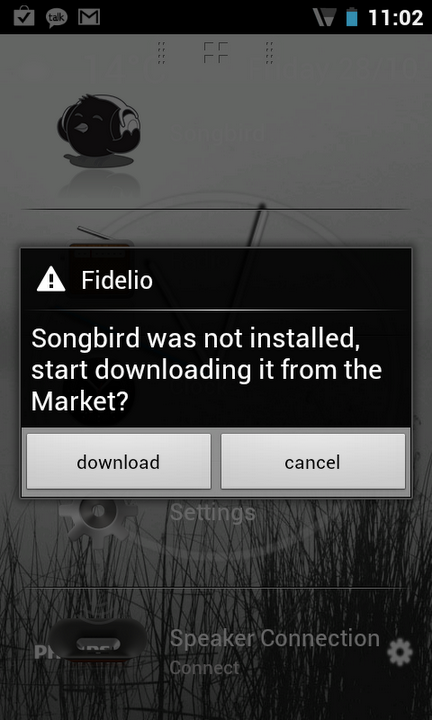 It states that users need an app from the Market called, Songbird to use it right when you first load it up. Okay, that makes sense. Maybe I need an app to use a custom interface that Philips has made for the dock. Nope, they just want you to download Songbird. It’s not needed to use the dock and it was quite misleading when it kept prompting me to download Songbird after opening the needed Philips Fidelio application. The Philips Fidelio app from the Market is an actual requirement. It’s used as a mediator between your phone and the dock, but it kind of hurts that I can’t just use Android’s native Bluetooth controls to set it up. These issues will only bug some who happen to constantly be plugging and unplugging your device. If you’re at the office though, and leave your phone plugged in all day, you’ll notice little problems. There is a saving grace though. The dock comes with an AUX input and it comes with a cable. You can simply plug and play which is a life saver if you find yourself having troubles with the Bluetooth. Only problem is, if you decide to use the AUX option, depending on which device you use (I have the Nexus S running through it), you can kiss your charging hopes goodbye since it docks through the bottom and has the speaker cable coming from the same area. There just isn’t enough room. The dock runs on AC but can also run on batteries. 4 AA’s to be exact. So you can set this bad boy up wherever you go. Camping, out fishing on the boat, or maybe your cars speakers are blown. 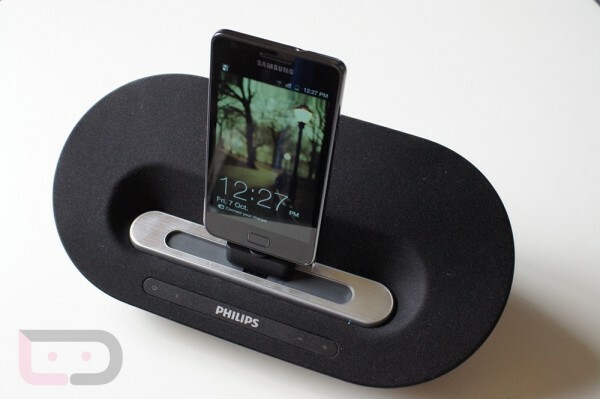 Whichever your mobile audio purposes are, the Philips dock should be able to meet your needs. Beyond some of the smaller frustrations that I wish did not exist at all, it does exactly what I had hoped it would. Plays music great, looks wonderful on my desk, and charges my device. Can’t ask for much more from a docking station. You can find yourself one of these Fidelio for Android (AS351) docks at Amazon for just $129. Thinking of picking one up?